The US "Department of Defense" costs 895 billion dollars a year, taken by force at gunpoint from productive Americans, but according to Newsmax.com, this week a high honcho in the FBI announced that "The probability that the U.S. will be hit with a weapons of mass destruction attack at some point is 100 percent." Therefore, every red cent of that stolen money is a total waste. The FedGov's massive war machine will not, in fact, defend us even from this worst of all possible types of attack. 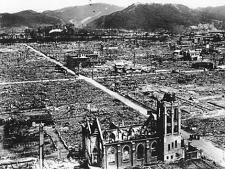 One day sooner or later, we shall be as defenseless as the residents of, say, Hiroshima. It's actually much worse yet. The projection of US military and other power worldwide has created enemies, one or more of whom (or a lone-wolf suicidal fanatic) will deploy those WMDs. Had that not been done, nobody holding WMDs would have had any reason to aim them in our direction. In the theory of limited government, ours might possibly have followed the 1804 advice of one of its founders, and maintained "peace, commerce, and honest friendship with all nations, entangling alliances with none" but two centuries of experience have proven conclusively that such limited government is impossible, so we have been entangled with every foreign nation and interest group on the Planet, even having military bases on over 130 of them. It comes as no surprise that the FBI's Dr. Majidi says that one of them, with 100% probability, will hit back - with WMDs. The referenced article's author, Ronald Kessler, fails to understand what's afoot even though he reports it. He writes: "In 2008, the FBI arrested Roger Bergendorff, who was found to have ricin and anarchist literature...." He explains that ricin is a form of WMD, but evidently does not understand what "anarchist" means. Let me tell him: it means one who believes in no rule, or no ruler. If Mr Bergendorff was planning to commit mass murder, he is therefore certainly no anarchist; for homicide is the ultimate act of ruling somone, removing his natural right to order his own life. The literature found on him may have used that word, but in that case it did so deceptively. There is one defense against WMDs, and one only: to deny a motive to all potential enemies. It is certainly not the aim of this Blog to recommend government in any shape, degree or posture; but the fact is that most of them exist without projecting worldwide military power and are not, accordingly, targetted by WMD owners small or large; those that have not contributed troops to the wars in Iraq or Afghanistan, for example, are accordingly quite well defended even without a bloated military establishment. By far the best way to prove that a society has no aggressive intent, and so to deny all potential enemies any motive for attack, is for it to have zero government; for if there is no government there can be no foreign policy, and if there is no foreign policy there can be no complaint about disagreeable discrimination. Therefore true anarchists are, far from being any kind of threat to the wellbeing of Americans, actually their only hope of peaceful survival. Thus the choice boils down to this: with all deliberate speed so as to minimize the risk that Dr Majidi's prophecy will be fulfilled sooner rather than later, all government here must be eliminated - or else we shall be eliminated; and that was said not just by me, but by one of their own. It's not rocket science.